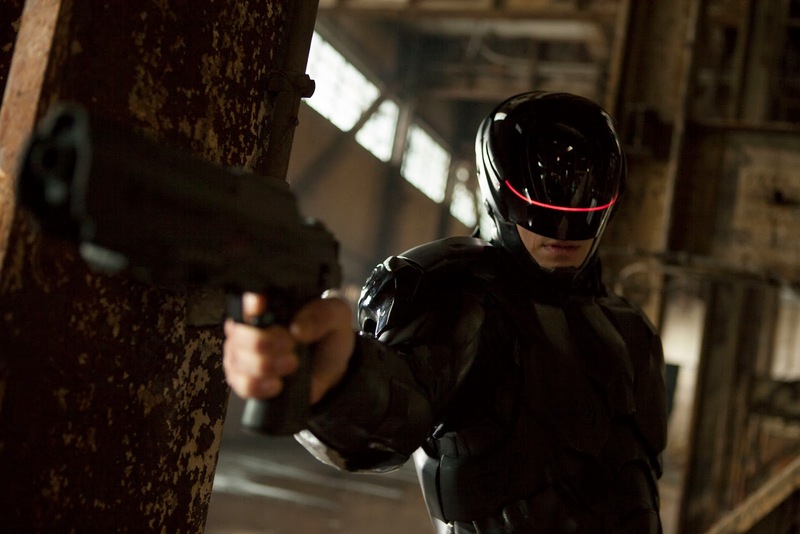 When it comes to franchise reboots, RoboCop ain’t exactly a sacred cow. Don’t get me wrong, Paul Verhoeven’s 1987 breakthrough is one of that decade’s most ambitious, and important, action cinema landmarks – a boldly gory and clever sci-fi shoot-em-up that unloads just as many incisive satirical jabs at Reagan-era U.S. culture as flesh-pulverizing bullets – and deserving of most of the praise awarded it. Yet, while the gloriously weird Dutch director went on to apply his surprise hit’s winning blend of social commentary and gut-churning violence to greater effect in 1990’s Total Recall and 1997’s Starship Troopers (his best American film), the titular character quickly, and pitifully, went to rust. The Frank Miller-penned RoboCop 2 upped its predecessor’s extreme blast-o-rama ugliness at the expense of innovation and wit, and the less said about the series’ pathetic threequel, short-lived TV incarnation or dud 2000 mini-series, Prime Directives, the better. So it’s hard to fault MGM and director Jose Padilha (of Elite Squad fame) for wanting to jump-start the long-dormant property back into cultural relevance. And you know something? Their efforts aren’t without merit. This update certainly lacks the edge and sniper-scope focus of Verhoeven’s original, but it also doesn’t wuss out from taking the character in some new and intriguing directions. Frankly, what prevents this flashier version 2.0 from hitting higher marks is its makers’ timid reluctance to completely un-cuff themselves from the established story elements of the adored source material. There’s a sling-shot effect akin to Rob Zombie’s infinitely worse Halloween redo; just when we think we’re heading somewhere fresh we get yanked back onto sacred, well-trod terrain. Still, at least in this case the journey is mostly worth taking, despite the underwhelming reality of the final destination. 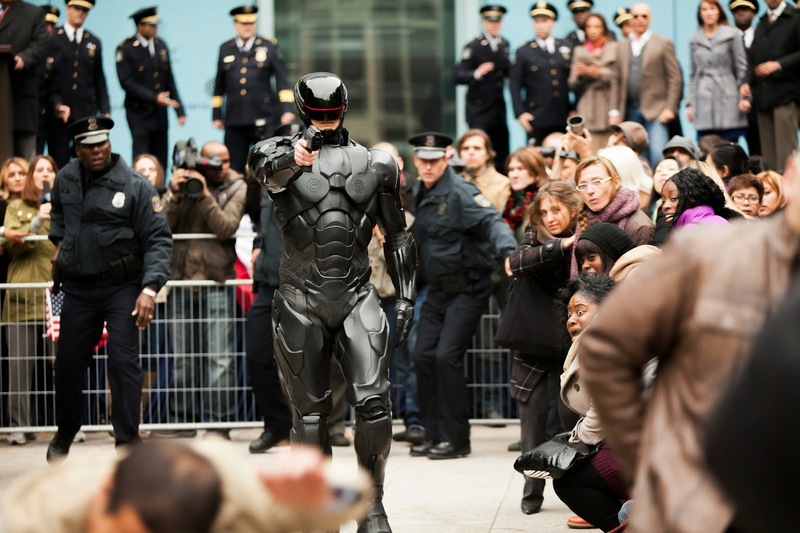 We’re (awkwardly) introduced into this Robocop's universe by a Bill O’Reilly-esque pundit buffoon played by Samuel L. Jackson, who feverishly explains that in the year 2028 America employs an endless array of drone soldiers in establishing order across the globe. Flush with success, Detroit robot manufacturer Omni Consumer Products, headed by the forward-thinking Raymond Sellars (a wonderfully twitchy Michael Keaton), are desperately hoping to topple a bill forbidding their mechanical creations from patrolling native soil. Their goal? To win over public support and change legislation by constructing an artificially intelligent law enforcer that appears more man than machine. 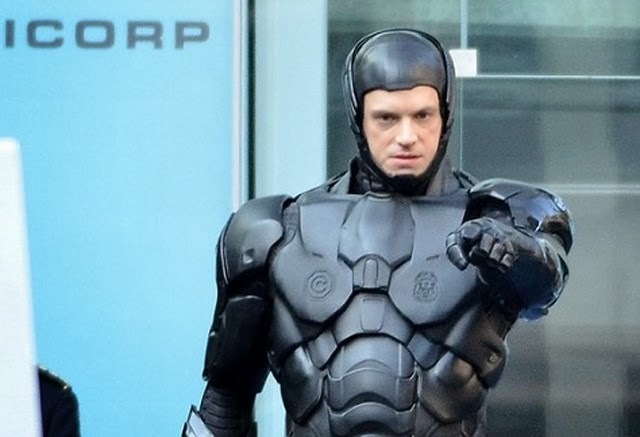 Lucky for OCP, they wind up with the perfect candidate for transformation in Alex Murphy (bland Peter Weller replacement Joel Kinnaman), a by-the-books local cop and family man who winds up in pieces after falling victim to a vicious crime lord’s car bomb. Reassembled into a flashy stainless steel abomination of flesh, wires and tubes by brilliant, well-meaning scientist Dr. Dennett Norton (Gary Oldman), Murphy fast becomes a thoroughly effective one-man weapon of justice and propaganda tool. 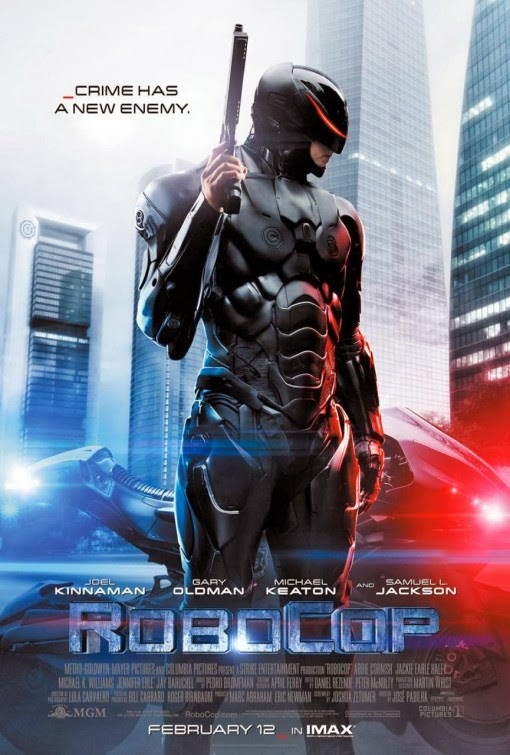 However, while OCP ruthlessly strips away Murphy’s pesky lingering humanity in order to craft the ideal mechanism, glimmers of it continue to resurface; reawakening feelings for the officer’s widowed wife (Abbie Cornish) and son (John Paul Ruttan), and threatening to unmask a vast criminal conspiracy. RoboCop is at its best in its first half; establishing the rule of OCP - an early sequence depicting an American military occupation of Iran is, dare I say, positively Verhoevenian - and charting the progress of Murphy’s transition into the tragic icon. This version dances more in the grey than the prior movie's black-and-white representation of maniacal corporate psychopaths gone wild, and we can understand the logic behind Keaton and Oldman’s decisions even if we don’t agree with them. There's a logical method to their madness. 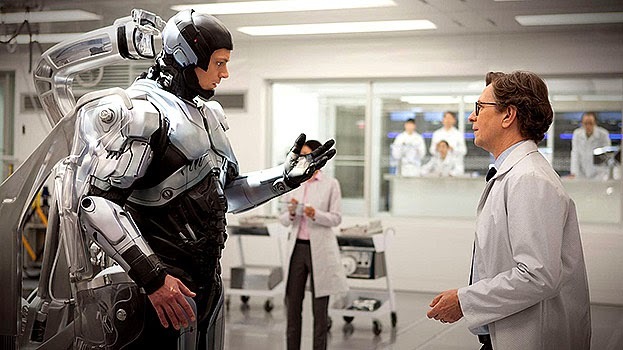 Similarly, this RoboCop doesn’t just emerge as a blank slate that slowly flickers back to consciousness. He’s now a frightened, grief-stricken human being who is horrified by his technological upgrade (the reveal of his existing mortal body parts is nightmarishly haunting, PG-13 rating be damned!) and must learn and adapt. Too often in reboots the expanded origin stuff is clumsy and unnecessary (Amazing Spider-Man, anyone? ), pointlessly over-complicating for the sake of justifying its own existence. Padilha and writer Joshua Zetumer are, thankfully, smarter than that. It’s compelling to watch Murphy not only react to his own dehumanization, but also endure OCP’s relentless training and tinkering, butting heads with Oldman and aggressive combat coach Jackie Earle Haley along the way. Sure, the increased emphasis on our hero's family is a bit too Movieland artificial – and, if you’ve ever seen an 80s action movie, you know exactly where his wife and son will be for the climax – but it allows a nice alternate perspective to our protagonist’s emotional arc. The heart does sink, though, once the grinding wheels of inevitability start up in the second hour, and the film begins slavishly marching to the plot beat of its ancestor. Alas, this time around there’s a sense of bloodlessness – both literally and figuratively – to the action and big crowd-pleasing set pieces that drains the film of much interest. An epic clash with hulking ED 209 attack bots criminally underwhelms due to its unfathomable editing and staging, and the extended shootouts, layered with intentional videogame overtones, are too sanitized and controlled to exhilarate. Robocop also lacks a truly despicable villain to actively root against, with Haley being the only worthy successor to the Kurtwood Smith throne. The rest are mostly forgettable nonentities (Jay Baruchel’s snarky OCP lackey is one manic coke-sniffing scene away from working) who come across more like target practice than worthwhile antagonists. Despite being conceived as a springboard for an ongoing series (the ending noticeably follows the template of most superhero movie franchise starters), this remake just doesn’t feel like it warrants any further chapters by the time credits roll. Rather, it’s a reasonably diverting, standard-issue spectacle with some cool ideas and fun performances that, thanks to Padilha’s efforts, entertains more often than not, in spite of a noticeable lack of fire and true purpose. Slickly engineered, test-marketed and costly in construction, this Robocop performs its duties sufficiently, but not efficiently.